How Does Your China Resume Compare to this 5-Year-Old’s? We’ve talked before about what should be on the ideal China resume. But, boy, have you got some competition! 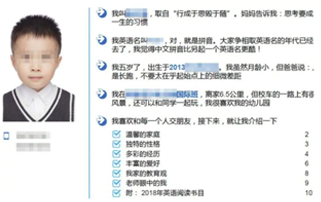 A 15-page CV of a five-year-old Chinese boy went viral last week after an entertainment blogger shared it on Weibo. In the resume, which was obviously written by the unnamed child’s ambitious parents, the boy is described as “confident”, “strong” and as having already enjoyed “rich and varied experience”, despite his tender years. His myriad after school hobbies were also listed, including hip-hop dancing, piano, football and the Chinese board game Go. The boy is described as being “strong” for having not cried after injections and “able to withstand defeat”, as he can reportedly concentrate on his studies even after being scolded. He also apparently writes three essays a week expressing his emotional state in English. Another section claims the boy has read 10,000 books in both English and Chinese, with his hundreds-strong reading list for this year alone attached as an appendix. The document also includes a colour-coded map of all the countries the boy has visited to date. Kid would have had to have read 6 books per day since the day he was born, something tells me this is total fang pi.